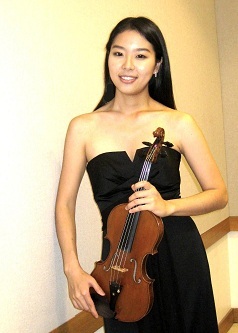 Violinist Jihye Joelle Kee has appeared as a soloist with orchestras including Eastman Symphony Orchestra and the Korean Canadian Symphony Orchestra. She distinguished herself in numerous competitions including the Atlantic Symphony Young Artist Competition (finalist) and Canadian Music Competition, and gave several recitals and concerts at venues throughout Canada and United States. She performed in master classes for renowned musicians such as Renaud Capuçon, Victor Danchenko, Leila Josefowicz and Ida Kavafian. As a full-scholarship recipient she participated in various summer festivals such as Music Academy of the West in Santa Barbara, Colorado College Music Festival and Texas Music Festival. She is also a passionate chamber and orchestra musician, coached by Mikhail Kopelmann, Peter Salaff, Stephen Rose, Toby Appel and the members of Ying Quartet, Tackas Quartet, and Cavani Quartet. Her trio won The Honor's Chamber Group audition and gave a performance in Kilbourn Hall and the trio was featured in the concert tour for New York Bible Conference for several years. Recently her string quartet received the top prize in the Glenn Gould School Chamber music Competition. Ms. Kee served as a section principal at the Kindred Spirit Orchestra in Ontraio and she has been featured of the Royal Conservatory Orchestra as a concertmaster under maestro Johannes Debus.